Many people in different countries are angry about their situation because their legitimate desires are not satisfied. And they struggle to find a solution to this situation. 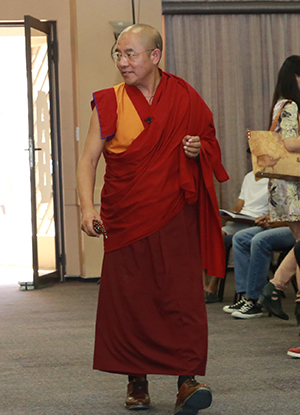 Khenpo Sodargye introduces a method of meditation, which can efficiently solve this problem as long as one keeps practicing according to the method. 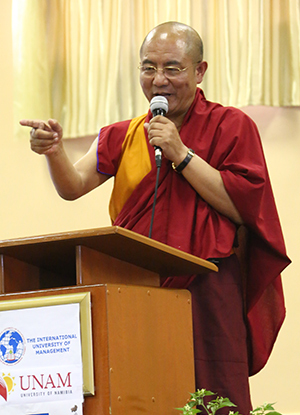 At the same time, Khenpo makes some pertinent suggestions to African nations to solve some tough problems they face. About my level of realization after meditation practice, I used to be very afraid of dying, however, through mediation practice I have understood that life and death in samsara are natural processes, and as a result of practice I am not so afraid now. More importantly, I feel myself full of love for others. My kindness embraces all sorts of beings, including enemies or strangers, which only grows stronger without regression. There are three types of Buddhist meditation. First, in the Theravada tradition, one focuses on the four foundations of mindfulness, and through which one recognizes the nature of self. Second, in the Tibetan tradition, one trains in the nine stages of training the mind until the mind becomes stable and malleable. Third, in the Zen tradition of Han, one enquires on “who am I” or “who are you”, and upon such contemplation, one gradually comes to know the nature of self.